For other uses, see Narcolepsy (disambiguation). Narcolepsy is a long-term neurological disorder that involves a decreased ability to regulate sleep-wake cycles. Symptoms include periods of excessive daytime sleepiness that usually last from seconds to minutes and may occur at any time. About 70% of those affected also experience episodes of sudden loss of muscle strength, known as cataplexy. These experiences can be brought on by strong emotions. Less commonly, there may be inability to move or vivid hallucinations while falling asleep or waking up. People with narcolepsy tend to sleep about the same number of hours per day as people without, but the quality of sleep tends to be worse. The exact cause of narcolepsy is unknown, with potentially several causes. In up to 10% of cases, there is a family history of the disorder. Often, those affected have low levels of the neuropeptide orexin, which may be due to an autoimmune disorder. Trauma, infections, toxins or psychological stress may also play a role. Diagnosis is typically based on the symptoms and sleep studies, after ruling out other potential causes. Excessive daytime sleepiness can also be caused by other sleep disorders such as sleep apnea, major depressive disorder, anemia, heart failure, drinking alcohol and not getting enough sleep. Cataplexy may be mistaken for seizures. While there is no cure, a number of lifestyle changes and medications may help. Lifestyle changes include taking regular short naps and sleep hygiene. Medications used include modafinil, sodium oxybate and methylphenidate. While initially effective, tolerance to the benefits may develop over time. Tricyclic antidepressants and selective serotonin reuptake inhibitors (SSRIs) may improve cataplexy. About 0.2 to 600 per 100,000 people are affected. The condition often begins in childhood. Men and women are affected equally. Untreated narcolepsy increases the risk of motor vehicle collisions and falls. The term "narcolepsy" is from the French narcolepsie. The French term was first used in 1880 by Jean-Baptiste-Édouard Gélineau, who used the Greek νάρκη (narkē), meaning "numbness", and λῆψις (lepsis) meaning "attack". There are two main characteristics of narcolepsy: excessive daytime sleepiness and abnormal REM sleep. The first, excessive daytime sleepiness (EDS), occurs even after adequate night time sleep. A person with narcolepsy is likely to become drowsy or fall asleep, often at inappropriate times and places, or just be very tired throughout the day. Narcoleptics are not able to experience the amount of restorative deep sleep that healthy people experience – they are not "over-sleeping". In fact, narcoleptics live their entire lives in a constant state of extreme sleep deprivation. Daytime naps may occur with little warning and may be physically irresistible. These naps can occur several times a day. They are typically refreshing, but only for a few hours or less. Vivid dreams may be experienced on a regular basis, even during very brief naps. Drowsiness may persist for prolonged periods or remain constant. In addition, night-time sleep may be fragmented, with frequent awakenings. A second prominent symptom of narcolepsy is abnormal REM sleep. Narcoleptics are unique in that they enter into the REM phase of sleep in the beginnings of sleep, even when sleeping during the day. The classic symptoms of the disorder, often referred to as the "tetrad of narcolepsy," are cataplexy, sleep paralysis, hypnagogic hallucinations, and excessive daytime sleepiness. Other symptoms may include automatic behaviors and night-time wakefulness. These symptoms may not occur in all patients. Cataplexy is an episodic loss of muscle function, ranging from slight weakness such as limpness at the neck or knees, sagging facial muscles, weakness at the knees often referred to as "knee buckling", or inability to speak clearly, to a complete body collapse. Episodes may be triggered by sudden emotional reactions such as laughter, anger, surprise, or fear, and may last from a few seconds to several minutes. The person remains conscious throughout the episode. In some cases, cataplexy may resemble epileptic seizures. Usually speech is slurred and vision is impaired (double vision, inability to focus), but hearing and awareness remain normal. Cataplexy also has a severe emotional impact on narcoleptics, as it can cause extreme anxiety, fear, and avoidance of people or situations that might elicit an attack. Cataplexy is generally considered to be unique to narcolepsy and is analogous to sleep paralysis in that the usually protective paralysis mechanism occurring during sleep is inappropriately activated. The opposite of this situation (failure to activate this protective paralysis) occurs in rapid eye movement behavior disorder. Hypnagogic hallucinations are vivid, often frightening, dreamlike experiences that occur while dozing or falling asleep. Hypnopompic hallucinations refer to the same sensations while awakening from sleep. These hallucinations may manifest in the form of visual or auditory sensations. Automatic behaviors occur when a person continues to function (talking, putting things away, etc.) during sleep episodes but awakens with no memory of performing such activities. It is estimated that up to 40 percent of people with narcolepsy experience automatic behavior during sleep episodes. In most cases, the first symptom of narcolepsy to appear is excessive and overwhelming daytime sleepiness. The other symptoms may begin alone or in combination months or years after the onset of the daytime naps. There are wide variations in the development, severity, and order of appearance of cataplexy, sleep paralysis, and hypnagogic hallucinations in individuals. Only about 20 to 25 percent of people with narcolepsy experience all four symptoms. The excessive daytime sleepiness generally persists throughout life, but sleep paralysis and hypnagogic hallucinations may not. A rare subset of narcoleptics also experience a heightened sense of taste and smell known as the supertaster phenomenon. Many people with narcolepsy also suffer from insomnia for extended periods of time. The excessive daytime sleepiness and cataplexy often become severe enough to cause serious problems in a person's social, personal, and professional life. Normally, when an individual is awake, brain waves show a regular rhythm. When a person first falls asleep, the brain waves become slower and less regular, which is called non-rapid eye movement (NREM) sleep. After about an hour and a half of NREM sleep, the brain waves begin to show a more active pattern again, called REM sleep (rapid eye movement sleep), when most remembered dreaming occurs. Associated with the EEG-observed waves during REM sleep, muscle atonia is present called REM atonia. In narcolepsy, the order and length of NREM and REM sleep periods are disturbed, with REM sleep occurring at sleep onset instead of after a period of NREM sleep. Also, some aspects of REM sleep that normally occur only during sleep, like lack of muscular control, sleep paralysis, and vivid dreams, occur at other times in people with narcolepsy. For example, the lack of muscular control can occur during wakefulness in a cataplexy episode; it is said that there is an intrusion of REM atonia during wakefulness. Sleep paralysis and vivid dreams can occur while falling asleep or waking up. Simply put, the brain does not pass through the normal stages of dozing and deep sleep but goes directly into (and out of) rapid eye movement (REM) sleep. As a consequence night time sleep does not include as much deep sleep, so the brain tries to "catch up" during the day, hence EDS. People with narcolepsy may visibly fall asleep at unpredicted moments (such motions as head bobbing are common). People with narcolepsy fall quickly into what appears to be very deep sleep, and they wake up suddenly and can be disoriented when they do (dizziness is a common occurrence). They have very vivid dreams, which they often remember in great detail. People with narcolepsy may dream even when they only fall asleep for a few seconds. Along with vivid dreaming, people with narcolepsy are known to have audio or visual hallucinations prior to falling asleep. Narcoleptics can gain excess weight; children can gain 20 to 40 lb (9 to 18 kg) when they first develop narcolepsy; in adults the body-mass index is about 15% above average. The exact cause of narcolepsy is unknown, and it may be caused by several distinct factors. Part of the mechanism involves the loss of orexin-releasing neurons within the lateral hypothalamus. In up to 10% of cases there is a family history of the disorder. There is a strong link with certain genetic variants. In addition to genetic factors, low levels of orexin peptides have been correlated with a past history of infection, diet, contact with toxins such as pesticides, and brain injuries due to brain tumors or strokes. Autoimmunity may also play a role. The primary genetic factor that has been strongly implicated in the development of narcolepsy involves an area of chromosome 6 known as the human leukocyte antigen (HLA) complex. Specific variations in HLA genes are strongly correlated with the presence of narcolepsy; however, these variations are not required for the condition to occur and sometimes occur in individuals without narcolepsy. These genetic variations in the HLA complex are thought to increase the risk of an auto-immune response to orexin-releasing neurons in the lateral hypothalamus. The allele HLA-DQB1*06:02 of the human gene HLA-DQB1 was reported in more than 90% of patients, and alleles of other HLA genes such as HLA-DQA1*01:02 have been linked. A 2009 study found a strong association with polymorphisms in the TRAC gene locus (dbSNP IDs rs1154155, rs12587781, and rs1263646). A 2013 review article reported additional but weaker links to the loci of the genes TNFSF4 (rs7553711), Cathepsin H (rs34593439), and P2RY11-DNMT1 (rs2305795). Another gene locus that has been associated with narcolepsy is EIF3G (rs3826784). A link between GlaxoSmithKline's H1N1 flu vaccine Pandemrix and childhood narcolepsy was investigated due to increased prevalence of narcolepsy in Irish, Finnish and Swedish children after vaccinations. Finland's National Institute of Health and Welfare recommended that Pandemrix vaccinations be suspended pending further investigation into 15 reported cases of children developing narcolepsy. In Finland in mid-November 2010, 37 cases of children's narcolepsy had been reported by doctors. This can be compared to the normal average of 3 cases of children's narcolepsy per year. "The incidence of narcolepsy with cataplexy in children/adolescents in the Swedish population increased during the pandemic and vaccination period, with a rapid decline in incidence during the post pandemic period." They concluded that these results "provide strengthened evidence that vaccination with Pandemrix during the pandemic period could be associated with an increase in the risk for narcolepsy with cataplexy in predisposed children/adolescents 19 years and younger." In 2013, the link between Pandemrix and narcolepsy was confirmed by a registry study by the Swedish Medical Products Agency, with a three-fold increase in risk for people under the age of 20. 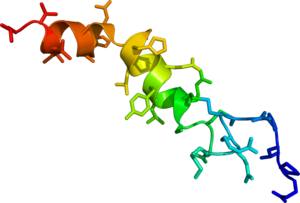 Orexin, otherwise known as hypocretin, is a neuropeptide that acts within the brain to regulate appetite and wakefulness as well as a number of other cognitive and physiological processes. While there are billions of cells in the human brain, only 10,000–20,000 neurons secrete orexin peptides; all of these neurons project out of the lateral hypothalamus. Loss of these orexin-producing neurons causes narcolepsy and most individuals with narcolepsy have a reduced number of these neurons in their brains. The neural control of normal sleep states and the relationship to narcolepsy are only partially understood. In humans, narcoleptic sleep is characterized by a tendency to go abruptly from a waking state to REM sleep with little or no intervening non-REM sleep. The changes in the motor and proprioceptive systems during REM sleep have been studied in both human and animal models. During normal REM sleep, spinal and brainstem alpha motor neuron hyperpolarization produces almost complete atonia of skeletal muscles via an inhibitory descending reticulospinal pathway. Acetylcholine may be one of the neurotransmitters involved in this pathway. In narcolepsy, the reflex inhibition of the motor system seen in cataplexy has features normally seen only in normal REM sleep. Diagnosis is relatively easy when all the symptoms of narcolepsy are present, but if the sleep attacks are isolated and cataplexy is mild or absent, diagnosis is more difficult. It is also possible for cataplexy to occur in isolation. Three tests that are commonly used in diagnosing narcolepsy are the polysomnogram, the multiple sleep latency test (MSLT), and administration of the Epworth Sleepiness Scale. These tests are usually performed by a sleep specialist. The polysomnogram involves continuous recording of sleep brain waves and a number of nerve and muscle functions during night time sleep. When tested, people with narcolepsy fall asleep rapidly, enter REM sleep early, and may often awaken during the night. The polysomnogram also helps to detect other possible sleep disorders that could cause daytime sleepiness. The Epworth Sleepiness Scale is a brief questionnaire that is administered to determine the likelihood of the presence of a sleep disorder, including narcolepsy. For the multiple sleep latency test, a person is given a chance to sleep every 2 hours during normal wake times. The patient is taken in usually for an overnight sleep study. The following day the patient will have multiple tests where they will be told to nap after a full nights sleep (usually eight hours). Observations are made of the time taken to reach various stages of sleep (sleep onset latency). This test measures the degree of daytime sleepiness and also detects how soon REM sleep begins. Again, people with narcolepsy fall asleep rapidly and enter REM sleep early. Occasionally, a multiple sleep latency test can result in a false-negative for a narcoleptic. The system which regulates sleep, arousal, and transitions between these states in humans is composed of three interconnected subsystems: the orexin projections from the lateral hypothalamus, the reticular activating system, and the ventrolateral preoptic nucleus. In narcoleptic individuals, these systems are all associated with impairments due to a greatly reduced number of hypothalamic orexin projection neurons and significantly fewer orexin neuropeptides in cerebrospinal fluid and neural tissue, compared to non-narcoleptic individuals. Those with narcolepsy generally experience the REM stage of sleep within five minutes of falling asleep, while people who do not have narcolepsy (unless they are significantly sleep deprived) do not experience REM until after a period of slow-wave sleep, which lasts for about the first hour or so of a sleep cycle. Measuring orexin levels in a person's cerebrospinal fluid sampled in a spinal tap may help in diagnosing narcolepsy, with abnormally low levels serving as an indicator of the disorder. This test can be useful when MSLT results are inconclusive or difficult to interpret. A "complaint of excessive sleepiness or sudden muscle weakness." Associated features that include: sleep paralysis; disrupted major sleep episode; hypnagogic hallucinations; automatic behaviors. Polysomnography with one or more of the following: "sleep latency less than 10 minutes;" "REM sleep latency less than 20 minutes;" an MSLT with a mean sleep latency less than 5 minutes; "two or more sleep-onset REM periods" (SOREMPs). Since the 2001 ICSD, the classification of primary hypersomnias has been steadily evolving, as further research has shown more overlap between narcolepsy and idiopathic hypersomnia. The 3rd edition of the ICSD is currently being finalized, and its new classification will label narcolepsy caused by orexin deficiency as “type 1 narcolepsy,” which is almost always associated with cataplexy. The other primary hypersomnias will remain subdivided based on the presence of SOREMPs. They will be labeled: “type 2 narcolepsy,” with 2 or more SOREMPs on MSLT; and “idiopathic hypersomnia,” with less than 2 SOREMPS. However, “there is no evidence that the pathophysiology or therapeutic response is substantially different for hypersomnia with or without SOREMPs on the MSLT.” Given this currently understood overlap of idiopathic hypersomnia and narcolepsy, the 5th edition of the Diagnostic and Statistical Manual of Mental Disorders (DSM-V) is also updating its classification of the primary hypersomnias. It reclassifies narcolepsy without cataplexy as major somnolence disorder (MSD). Additionally, MSD will encompass all syndromes of hypersomnolence not explained by low orexin concentrations, including idiopathic hypersomnia (with and without long sleep time) and long sleepers (people requiring >10 hours sleep/day). Further complicating these updated classification schemes, overlap between narcolepsy with cataplexy and idiopathic hypersomnia has also been reported. A subgroup of narcoleptics with long sleep time, comprising 18% of narcoleptics in one study, had symptoms of both narcolepsy with cataplexy and idiopathic hypersomnia (long sleep time and unrefreshing naps). It is believed that this subgroup might have dysfunction in multiple arousal systems, including orexin and GABA (see idiopathic hypersomnia causes). The main treatment of excessive daytime sleepiness in narcolepsy is central nervous system stimulants such as methylphenidate, amphetamine, dextroamphetamine, modafinil, and armodafinil. In late 2007 an alert for severe adverse skin reactions to modafinil was issued by the FDA. Another drug that is used is atomoxetine, a non-stimulant and a norepinephrine reuptake inhibitor (NRI), which has no addiction liability or recreational effects. In many cases, planned regular short naps can reduce the need for pharmacological treatment of the EDS, but only improve symptoms for a short duration. A 120-minute nap provided benefit for 3 hours in patient alertness whereas a 15-minute nap provided no benefit. Daytime naps are not a replacement for night time sleep. Ongoing communication between the health care provider, patient, and the patient's family members is important for optimal management of narcolepsy. Another FDA-approved treatment option for narcolepsy is sodium oxybate, also known as sodium gamma-hydroxybutyrate (GHB). It can be used for cataplexy associated with narcolepsy and excessive daytime sleepiness associated with narcolepsy. Narcolepsy has sometimes been treated with selective serotonin reuptake inhibitors and tricyclic antidepressants, such as clomipramine, imipramine, or protriptyline, as well as other drugs that suppress REM sleep. Venlafaxine, an antidepressant which blocks the reuptake of serotonin and norepinephrine, has shown usefulness in managing symptoms of cataplexy, however, it has notable side-effects including sleep disruption. In the United States, it is estimated that this condition afflicts as many as 200,000 Americans, but fewer than 50,000 are diagnosed. It is as widespread as Parkinson's disease or multiple sclerosis and more prevalent than cystic fibrosis, but it is less well known. Narcolepsy is often mistaken for depression, epilepsy, or the side effects of medications. It can also be mistaken for poor sleeping habits, recreational drug use, or laziness. Narcolepsy can occur in both men and women at any age, although its symptoms are usually first noticed in teenagers or young adults. There is strong evidence that narcolepsy may run in families; around 10 percent of people diagnosed with narcolepsy with cataplexy have a close relative with this neurological disorder. While narcolepsy symptoms are often confused with depression, there is a link between the two disorders. Research studies have mixed results on co-occurrence of depression in narcolepsy patients - the numbers quoted by different studies are anywhere between 6% and 50%. Narcolepsy has its typical onset in adolescence and young adulthood. There is an average 15-year delay between onset and correct diagnosis which may contribute substantially to the disabling features of the disorder. Cognitive, educational, occupational, and psychosocial problems associated with the excessive daytime sleepiness of narcolepsy have been documented. For these to occur in the crucial teen years when education, development of self-image, and development of occupational choice are taking place is especially devastating. While cognitive impairment does occur, it may only be a reflection of the excessive daytime somnolence. The prevalence of narcolepsy is about 1 per 2,000 persons. It is a reason for patient visits to sleep disorder centers, and with its onset in adolescence, it is also a major cause of learning difficulty and absenteeism from school. Normal teenagers often already experience excessive daytime sleepiness because of a maturational increase in physiological sleep tendency accentuated by multiple educational and social pressures; this may be disabling with the addition of narcolepsy symptoms in susceptible teenagers. In clinical practice, the differentiation between narcolepsy and other conditions characterized by excessive somnolence may be difficult. Treatment options are currently limited. There is a paucity in the literature of controlled double-blind studies of possible effective drugs or other forms of therapy. Mechanisms of action of some few available therapeutic agents have been explored but detailed studies of mechanisms of action are needed before new classes of therapeutic agents can be developed. Narcolepsy is an underdiagnosed condition in the general population. This is partly because its severity varies, so it can be mistaken for other illnesses very easily. Some people with narcolepsy do not suffer from loss of muscle control. In 2015, it was reported that the British Department of Health was paying for sodium oxybate medication at a cost of £12,000 a year for 80 people who are taking legal action over problems linked to the use of the Pandemrix swine flu vaccine. Sodium oxybate is not available to people with narcolepsy through the National Health Service. "Based on the role of histamine in keeping people awake (and hence the common side effect of anti-histamines such as diphenhydramine causing sleepiness), medications that act on histamine are under development for the treatment of excessive sleepiness." It remains to be seen whether these H3 antagonists (i.e., compounds such as pitolisant that promote the release of the wake-promoting amine histamine) will be particularly useful as wake-promoting agents. Given the possible role of hyper-active GABAA receptors in the primary hypersomnias (narcolepsy and idiopathic hypersomnia), medications that could counteract this activity are being studied to test their potential to improve sleepiness. These currently include clarithromycin and flumazenil. Flumazenil is the only GABAA receptor antagonist on the market as of Jan 2013, and it is currently manufactured only as an intravenous formulation. Given its pharmacology, researchers consider it to be a promising medication in the treatment of primary hypersomnias. Results of a small, double-blind, randomized, controlled clinical trial were published in November 2012. This research showed that flumazenil provides relief for most patients whose CSF contains the unknown "somnogen" that enhances the function of GABAA receptors, making them more susceptible to the sleep-inducing effect of GABA. For one patient, daily administration of flumazenil by sublingual lozenge and topical cream has proven effective for several years. A 2014 case report also showed improvement in primary hypersomnia symptoms after treatment with a continuous subcutaneous flumazenil infusion. The supply of generic flumazenil was initially thought to be too low to meet the potential demand for treatment of primary hypersomnias. However, this scarcity has eased, and dozens of patients are now being treated with flumazenil off-label. Orexin-A (a.k.a. hypocretin-1) has been shown to be strongly wake-promoting in animal models, but unfortunately it does not cross the blood-brain barrier. Therefore, companies have developed orexin receptor antagonists, like suvorexant, for the treatment of insomnia. It is also likely that an orexin-A receptor agonist will be found and developed for the treatment of hypersomnia. Abnormally low levels of acylcarnitine have been observed in people with narcolepsy. These same low levels have been associated with primary hypersomnia in general in mouse studies. “Mice with systemic carnitine deficiency exhibit a higher frequency of fragmented wakefulness and rapid eye movement (REM) sleep, and reduced locomotor activity.” Administration of acetyl-L-carnitine was shown to improve these symptoms in mice. A subsequent human trial found that narcolepsy patients given L-carnitine spent less total time in daytime sleep than patients who were given a placebo. ^ a b c d e f g h i j k l m n o p q r s t u v w x y z aa ab ac ad ae af ag ah ai aj "Narcolepsy Fact Sheet". NINDS. NIH Publication No. 03-1637. Archived from the original on 27 July 2016. Retrieved 19 August 2016. ^ a b Goswami M, Thorpy MJ, Pandi-Perumal SR (2016). Narcolepsy: A Clinical Guide (2nd ed.). Springer. p. 39. ISBN 9783319237398. ^ a b "Narcolepsy Information Page". NINDS. Archived from the original on 7 January 2017. Retrieved 7 January 2017. ^ a b Harper, Douglas (2010). "Narcolepsy". Dictionary.com. Online Etymology Dictionary. Archived from the original on 8 September 2017. Retrieved 19 August 2016. ^ a b c d e f g Green, Simon (2011). Biological rhythms, sleep, and hypnosis. Basingstoke, Hampshire, England: Palgrave Macmillan. ISBN 9780230252653. ^ Kandel, Eric R.; Schwartz, James H.; Jessell, Thomas M., eds. (2000). Principles of Neural Science (4th ed.). McGraw-Hill. p. 949. ISBN 978-0-8385-7701-1. ^ Cunha, John P. Shiel, Jr., William C. (ed.). "Narcolepsy". MedicineNet. Archived from the original on 24 March 2016. Retrieved 15 March 2016. ^ Zorick FJ, Salis PJ, Roth T, Kramer M (April 1979). "Narcolepsy and automatic behavior: a case report". The Journal of Clinical Psychiatry. 40 (4): 194–7. PMID 422531. ^ "About Narcolepsy". Stanford Center for Narcolepsy. Archived from the original on 18 March 2016. Retrieved 15 January 2016. ^ Dunham CK (2010). "Narcolepsy presenting as pseudoseizures". Primary Care Companion to the Journal of Clinical Psychiatry. 12 (2). doi:10.4088/PCC.09l00793whi. PMC 2910991. PMID 20694129. ^ Scammell TE (December 2015). "Narcolepsy". The New England Journal of Medicine. 373 (27): 2654–62. doi:10.1056/NEJMra1500587. PMID 26716917. ^ Nevsimalova S (August 2014). "The diagnosis and treatment of pediatric narcolepsy". Current Neurology and Neuroscience Reports. 14 (8): 469. doi:10.1007/s11910-014-0469-1. PMID 24954623. ^ a b c d e f g h i j Mahlios J, De la Herrán-Arita AK, Mignot E (October 2013). "The autoimmune basis of narcolepsy". Current Opinion in Neurobiology. 23 (5): 767–73. doi:10.1016/j.conb.2013.04.013. PMC 3848424. PMID 23725858. Narcolepsy is a neurological disorder characterized by excessive daytime sleepiness, cataplexy, hypnagonic hallucinations, sleep paralysis, and disturbed nocturnal sleep patterns. ^ a b c d e Malenka RC, Nestler EJ, Hyman SE (2009). "Chapter 12: Sleep and Arousal". In Sydor A, Brown RY (eds.). Molecular Neuropharmacology: A Foundation for Clinical Neuroscience (2nd ed.). New York: McGraw-Hill Medical. pp. 294–296, 303. ISBN 9780071481274. the loss of orexin neurons raise the interesting possibility that narcolepsy may be caused by an autoimmune mediated destruction of these neurons in analogy with the autoimmune destruction of insulin-secreting β-islet cells in type I diabetes. ^ "Narcolepsy Fact Sheet". Nature. doi:10.1038/nature.2013.14413. 2013. doi:10.1038/nature.2013.14413. Retrieved 25 November 2018. ^ Klein J, Sato A (September 2000). "The HLA system. Second of two parts". The New England Journal of Medicine. 343 (11): 782–6. doi:10.1056/NEJM200009143431106. PMID 10984567. ^ a b c Mignot E (November 2001). "A commentary on the neurobiology of the hypocretin/orexin system". Neuropsychopharmacology. 25 (5 Suppl): S5–13. doi:10.1016/S0893-133X(01)00316-5. PMID 11682267. ^ Hallmayer J, Faraco J, et al. (June 2009). "Narcolepsy is strongly associated with the T-cell receptor alpha locus". Nature Genetics. 41 (6): 708–11. doi:10.1038/ng.372. PMC 2803042. PMID 19412176. ^ Singh AK, Mahlios J, Mignot E (June 2013). "Genetic association, seasonal infections and autoimmune basis of narcolepsy". Journal of Autoimmunity. 43: 26–31. doi:10.1016/j.jaut.2013.02.003. PMC 4118764. PMID 23497937. ^ Holm A, Lin L, Faraco J, Mostafavi S, Battle A, Zhu X, Levinson DF, Han F, Gammeltoft S, Jennum P, Mignot E, Kornum BR (November 2015). "EIF3G is associated with narcolepsy across ethnicities". European Journal of Human Genetics. 23 (11): 1573–80. doi:10.1038/ejhg.2015.4. PMC 4613472. PMID 25669430. ^ "The MPA investigates reports of narcolepsy in patients vaccinated with Pandemrix". Swedish Medical Products Agency. 18 August 2010. Archived from the original on 17 February 2011. Retrieved 19 August 2010. ^ "Terveyden ja hyvinvoinnin laitos suosittaa Pandemrix-rokotusten keskeyttämistä". National Institute of Health and Welfare. 24 August 2010. Retrieved 24 August 2010. ^ "Ties Between Big Pharma and THL Draw Complaints". Yle Uutiset. 17 November 2010. Archived from the original on 18 October 2011. Retrieved 15 March 2016. ^ "Occurrence of narcolepsy with cataplexy among children and adolescents in relation to the H1N1 pandemic and Pandemrix vaccinations: Results of a case inventory study by the MPA in Sweden during 2009‐2010" (PDF). Läkemedelsverket Medical Products Agency. 30 June 2011. pp. 1, 10. Archived (PDF) from the original on 21 March 2016. Retrieved 15 March 2016. ^ "Registry study confirms increased risk of narcolepsy after vaccination with Pandemrix in children and adolescents and shows an increased risk in young adults". Läkemedelsverket Medical Products Agency. 26 March 2013. Archived from the original on 9 March 2016. Retrieved 15 March 2016. ^ Malenka RC, Nestler EJ, Hyman SE (2009). "Chapter 6: Widely Projecting Systems: Monoamines, Acetylcholine, and Orexin". In Sydor A, Brown RY (eds.). Molecular Neuropharmacology: A Foundation for Clinical Neuroscience (2nd ed.). New York: McGraw-Hill Medical. p. 179. ISBN 9780071481274. Orexinergic projections in the CNS. Orexin neurons with cell bodies in the lateral hypothalamic area (LHA) and posterior hypothalamus (PH) project throughout the brain (excluding the cerebellum) with dense projections to the noradrenergic locus ceruleus (LC), histaminergic tuberomamillary nucleus (TMN), serotonergic raphe nuclei, cholinergic laterodorsal and pedunculopontine nuclei (LDT and PPT), and the dopaminergic ventral tegmental area (VTA). ^ Thorpy MJ (June 1992). "The clinical use of the Multiple Sleep Latency Test. The Standards of Practice Committee of the American Sleep Disorders Association". Sleep. 15 (3): 268–76. doi:10.1093/sleep/15.3.268. PMID 1621030. ^ Beersma DG, Dijk DJ, Blok CG, Everhardus I (August 1990). "REM sleep deprivation during 5 hours leads to an immediate REM sleep rebound and to suppression of non-REM sleep intensity". Electroencephalography and Clinical Neurophysiology. 76 (2): 114–22. doi:10.1016/0013-4694(90)90209-3. PMID 1697239. Archived from the original on 24 September 2014. ^ "Narcolepsy Research - FAQs". Stanford Center for Narcolepsy. Archived from the original on 13 November 2015. Retrieved 15 January 2016. ^ Mignot E, Lammers GJ, Ripley B, Okun M, Nevsimalova S, Overeem S, Vankova J, Black J, Harsh J, Bassetti C, Schrader H, Nishino S (October 2002). "The role of cerebrospinal fluid hypocretin measurement in the diagnosis of narcolepsy and other hypersomnias". Archives of Neurology. 59 (10): 1553–62. doi:10.1001/archneur.59.10.1553. PMID 12374492. ^ "About Hypersomnia". Hypersomnia Foundation. Archived from the original on 22 June 2013. ^ a b c "International classification of sleep disorders, revised: Diagnostic and coding manual" (PDF). American Academy of Sleep Medicine. 2001. Archived from the original (PDF) on 26 July 2011. Retrieved 25 January 2013. ^ Bassetti, C (1997). "Idiopathic hypersomnia A series of 42 patients". Brain. 120 (8): 1423–1435. doi:10.1093/brain/120.8.1423. ^ a b c d e f Mignot EJ (October 2012). "A practical guide to the therapy of narcolepsy and hypersomnia syndromes". Neurotherapeutics. 9 (4): 739–52. doi:10.1007/s13311-012-0150-9. PMC 3480574. PMID 23065655. ^ "Diagnosis of Idiopathic Hypersomnia/ Major Hypersomnolence Disorder". Archived from the original on 17 May 2013. Retrieved 23 April 2013. ^ "Recent Updates to Proposed Revisions for DSM-5: Sleep-Wake Disorders". DSM-5 Development. American Psychiatric Association. Archived from the original on 20 June 2013. ^ Vernet, Cyrille (2009). "Narcolepsy with Long Sleep Time". Sleep. 32 (9): 1229–1235. doi:10.1093/sleep/32.9.1229. PMC 2737581. ^ "Modafinil (marketed as Provigil): Serious Skin Reactions". Postmarketing Reviews. 1 (1). Fall 2007. Archived from the original on 4 March 2016. Retrieved 15 March 2016. ^ Helmus T, Rosenthal L, Bishop C, Roehrs T, Syron ML, Roth T (April 1997). "The alerting effects of short and long naps in narcoleptic, sleep deprived, and alert individuals". Sleep. 20 (4): 251–7. doi:10.1093/sleep/20.4.251. PMID 9231950. ^ a b "XYREM® (sodium oxybate)" (PDF). United States Food and Drug Administration. Jazz Pharmaceuticals, Inc. 11 April 2014. Archived (PDF) from the original on 4 March 2016. Retrieved 9 August 2015. ^ "FDA Approval Letter for Xyrem; Indication: Cataplexy associated with narcolepsy; 17 Jul 2002" (PDF). Archived (PDF) from the original on 17 October 2012. ^ Wise MS, Arand DL, Auger RR, Brooks SN, Watson NF (December 2007). "Treatment of narcolepsy and other hypersomnias of central origin". Sleep. 30 (12): 1712–27. doi:10.1093/sleep/30.12.1712. PMC 2276130. PMID 18246981. ^ Boscolo-Berto R, Viel G, Montagnese S, Raduazzo DI, Ferrara SD, Dauvilliers Y (October 2012). "Narcolepsy and effectiveness of gamma-hydroxybutyrate (GHB): a systematic review and meta-analysis of randomized controlled trials". Sleep Medicine Reviews. 16 (5): 431–43. doi:10.1016/j.smrv.2011.09.001. PMID 22055895. ^ Gowda CR, Lundt LP (December 2014). "Mechanism of action of narcolepsy medications". CNS Spectrums. 19 Suppl 1 (Supplement 1): 25–33, quiz 25–7, 34. doi:10.1017/S1092852914000583. PMID 25403789. ^ Caputo F, Zoli G (March 2007). "Treatment of narcolepsy with cataplexy". Lancet. 369 (9567): 1080–1. doi:10.1016/S0140-6736(07)60522-4. PMID 17398302. ^ "NAMI, National Alliance on Mental Illness, Effexor, Common Side Effects". Archived from the original on 18 July 2012. ^ a b "Who Is At Risk for Narcolepsy?". Archived from the original on 22 September 2008. ^ "Link Between Narcolepsy and Mental Health". Archived from the original on 9 August 2014. Retrieved 6 June 2014. ^ Thorpy MJ, Krieger AC (May 2014). "Delayed diagnosis of narcolepsy: characterization and impact". Sleep Medicine. 15 (5): 502–7. doi:10.1016/j.sleep.2014.01.015. PMID 24780133. ^ "DH funds private prescriptions for drug denied to NHS patients". Health Service Journal. 20 July 2015. Archived from the original on 24 September 2015. Retrieved 20 July 2015. ^ "Hypersomnia Foundation - Treatment". Archived from the original on 8 June 2013. ^ a b Lynn Marie Trotti, MD (9 August 2010). "Flumazenil for the Treatment of Primary Hypersomnia". Emory University - Georgia Research Alliance. ClinicalTrials.gov. Archived from the original on 28 October 2012. ^ a b Lynn Marie Trotti, MD (15 June 2010). "Clarithromycin for the Treatment of Primary Hypersomnia". Emory University - Georgia Research Alliance. ClinicalTrials.gov. Archived from the original on 1 December 2012. ^ Rye DB, Bliwise DL, Parker K, Trotti LM, Saini P, Fairley J, Freeman A, Garcia PS, Owens MJ, Ritchie JC, Jenkins A (November 2012). "Modulation of vigilance in the primary hypersomnias by endogenous enhancement of GABAA receptors". Science Translational Medicine. 4 (161): 161ra151. doi:10.1126/scitranslmed.3004685. PMID 23175709. ^ Kelty E, Martyn V, O'Neil G, Hulse G (July 2014). "Use of subcutaneous flumazenil preparations for the treatment of idiopathic hypersomnia: A case report". Journal of Psychopharmacology. 28 (7): 703–6. doi:10.1177/0269881114523865. PMID 24554692. ^ Beck, Melinda (10 December 2012). "Scientists Try to Unravel the Riddle of Too Much Sleep". The Wall Street Journal. Archived from the original on 8 August 2017. ^ "Hypersomnia Update". Emory University. Archived from the original on 31 May 2014. Retrieved 22 April 2014. ^ Trotti, L; et al. (June 2013). "Clarithromycin for the Treatment of Hypersomnia: A Randomized, Double-Blind, Placebo-Controlled, Crossover Trial". Sleep. 36 (Abstract Supplement): A248. ^ Trotti LM, Saini P, Freeman AA, Bliwise DL, García PS, Jenkins A, Rye DB (July 2014). "Improvement in daytime sleepiness with clarithromycin in patients with GABA-related hypersomnia: Clinical experience". Journal of Psychopharmacology. 28 (7): 697–702. doi:10.1177/0269881113515062. PMID 24306133. ^ Miyagawa T, Miyadera H, Tanaka S, Kawashima M, Shimada M, Honda Y, Tokunaga K, Honda M (March 2011). "Abnormally low serum acylcarnitine levels in narcolepsy patients". Sleep. 34 (3): 349–53A. doi:10.1093/sleep/34.3.349. PMC 3041711. PMID 21358852. ^ Miyagawa T, Honda M, Kawashima M, Shimada M, Tanaka S, Honda Y, Tokunaga K (30 April 2009). "Polymorphism located between CPT1B and CHKB, and HLA-DRB1*1501-DQB1*0602 haplotype confer susceptibility to CNS hypersomnias (essential hypersomnia)". PLOS One. 4 (4): e5394. Bibcode:2009PLoSO...4.5394M. doi:10.1371/journal.pone.0005394. PMC 2671172. PMID 19404393. ^ Miyagawa T, Kawamura H, Obuchi M, Ikesaki A, Ozaki A, Tokunaga K, Inoue Y, Honda M (2013). "Effects of oral L-carnitine administration in narcolepsy patients: a randomized, double-blind, cross-over and placebo-controlled trial". PLOS One. 8 (1): e53707. Bibcode:2013PLoSO...853707M. doi:10.1371/journal.pone.0053707. PMC 3547955. PMID 23349733. Mitler MM, Hajdukovic R (June 1991). "Relative efficacy of drugs for the treatment of sleepiness in narcolepsy". Sleep. 14 (3): 218–20. doi:10.1093/sleep/14.3.218. PMC 2246380. PMID 1680245. Chabas D, Taheri S, Renier C, Mignot E (October 2003). "The genetics of narcolepsy". Annual Review of Genomics and Human Genetics. 4: 459–83. doi:10.1146/annurev.genom.4.070802.110432. PMID 14527309. Smith AJ, Jackson MW, Neufing P, McEvoy RD, Gordon TP (2004). "A functional autoantibody in narcolepsy". Lancet. 364 (9451): 2122–4. doi:10.1016/S0140-6736(04)17553-3. PMID 15589310. Wikimedia Commons has media related to Narcolepsy. "Narcolepsy Information Page". National Institute of Neurological Disorders and Stroke.